Spring brings warmth and lightness. We trade in our woolens for cotton and linen. Windows are opened to the heady scents of daphne and plum blossoms. Neighbors congregate outside to catch up on news after months of winter isolation. The grey brown winter palette is replaced by a melee of pink, blue, yellow, red, and violet. Seedlings push through the soil and leaves begin to open up. The air is filled with potential energy. Asparagus, raab, and peas are consumed with wild abandon. The seasonal yard work and garden planning brings about ambitious projects. Last weekend after hours of gardening, Mr. Graham and I craved refreshment, but soon discovered that we were out of tonic water. We did have some precious limes that had to be used. Ever since the lime shortage started, they are like gold, each one consumed with reverence. What to make? I wanted something light, fancy, and tall. I remembered the gin fizz. Before we make gin fizzes, I want to delve into some definitions. What is a fizz? Simply put, it is an effervescent variation of the sour. If you combine sour (citrus) and bubbles (seltzer) with booze, it is a fizz. Add gin for a gin fizz; add whiskey for a whiskey fizz. Easy peasy. There are so many tasty variations of the gin fizz. I will gladly enjoy a violet gin fizz or a rhubarb gin fizz. The possibilities are endless. My favorite is the Ramos gin fizz. A Ramos gin fizz adds egg white, cream, and orange flower water to a basic gin fizz. This cocktail was created by Henry C. Ramos at the Imperial Cabinet Saloon in New Orleans in 1888. One sip and you will see why this recipe survives. The perfect brunch or afternoon drink. Combine everything except the ice and seltzer in a mason jar. Shake vigorously to combine and froth. Add ice to the jar and shake again for a few minutes (the original recipe suggests shaking it for 12 minutes, if you have the stamina, go for it). It helps if you share the shaking with a friend or two. Strain into into highball glasses. Top each glass with 1 ounce of seltzer and stir. Garnish with a wheel of citrus and/or a pretty blossom: A citrus blossom, violet, or borage flower are all good candidates. We used some plum blossoms. Other techniques to explore: Some day I would like to try making them this way. Also, our friends, Lemon and Julia, make them in a blender - quick and delicious. Come join us under the plum blossoms with a tall glass of gin fizz and enjoy some refreshment. Time for a Ramos gin fizz! When you return from a trip do you find that certain details linger? Maybe the turquoise green of a sea anemone in a tide pool or the warm scent of plumeria? There is often an urge to recreate something enjoyed on an adventure, such as a pumpkin seed mole, a mai tai, or Boston brown bread. You can bring back the adventure with a sip or a bite. But what about our micro-adventures? Because my time is so limited these days I try to glean inspiration from a walk in the neighborhood or while I am out running errands. The trick is to see things with new eyes. There is inspiration lurking for those who take notice. When we slow down and really look around there are tiny changes in the season, new bits of color, and a plethora of ideas. Ordinary things can bring inspiration, whether it be a persimmon tree bent with fruit, the wavy reflection of buildings in a puddle, or an interesting rock. When I am feeling stuck or frustrated, sometimes the best thing is to open the door and get out in the yard. The act of pulling a few weeds provides just the right attitude adjustment. On my walks I try to collect things visually, but I must admit that I have come home with a few leaves, acorns, or dandelions in my pocket. Last summer we had friends visiting from out of town. We were walking back home from a trip to our local bookstore when we passed a huge patch of red shiso in a front yard. It was growing like a weed. It really needed to be pinched back, so I was compelled to take home a couple of leaves. I know better, but I am a terrible neighbor! When we came home I made cocktails with gin, muddled shiso, and backyard plums. Crime has never tasted so good. I must admit that I am not just a thief, but a litterbug too. In San Francisco I lived near Billy Goat Hill and would take regular neighborhood walks. Occasionally I would collect fallen eucalyptus leaves to use in art projects. I had an old typewriter and would type nonsensical messages on the leaves, filling the room with the wonderful, but slightly clinical, eucalyptus scent. On my next walk, I would leave the altered leaves on a park bench, along a sidewalk, or on a stairway path for a passerby to find. I only witnessed one person find my leaves. I had left a poem that was typed across several leaves left in a row. I saw a Buddhist monk pick them up, read them, chuckle, and put them back. It has been a long time since I left these little gifts, but I do try to make something from my walks, usually something you can sip. So this brings me to my point. I want to start a new series here: I want to share food and drinks based on a walk or an adventure. This assignment will change with the season, my moods, what I have foraged, and my travels near and far. I challenge you to do this too. You don’t have to go far, a walk in the neighborhood, a trip to a farmers market, or your weekend errands. Walks like these will open you up, provide some perspective, and maybe inspire you to try something different. This time of year my daughter and I like to take blossom walks. Portland is truly impressive in its blossom finery. Entire streets are littered with camellia blooms and pink snow falls from ornamental cherry trees. The normally grey sky shines a purplish pink above the canopy of blossoms. This time of year our first violets appear on the south side of the yard. The combination of the blossom sky and the appearance of violets made me want to make a violet based cocktail. Violets are sweet, but have a slightly perfumey flavor. They are lovely on top of cakes or in salads. Did you know that they also provide essential spring time nutrition? They help provide our bodies with moisture after being exposed to months of dry winter air. Violets are nice in a simple syrup or jelly, although I find that it concentrates the perfuminess. I prefer mine raw or candied. I thought they would be nice in an Aviation, to take place of Creme de Violette, which I find to be cloyingly sweet. I felt a little bad for muddling these delicate blooms, but they made a lovely drink. Cocktails the color of the blossom sky. In a shaker or mason jar gently muddle the violets in the lemon juice. Add the gin, liqueur, and ice. Shake well and strain into small cocktail or Nick and Nora glasses. Garnish with violet flowers. About Maraschino liqueur: This clear liqueur is essential in classic cocktails such as an aviation, a Martinez, or a Hemingway daiquiri. It adds a bit of body and sweetness, with lingering flavors of cherry, almond, and violet. It is distilled from marasca cherries from Dalmatia. I sometimes feel caught somewhere between wanderlust and homesickness. Moving back to Oregon has tempered some of the homesickness, but I do feel a strong desire to get out and explore. To pack up the family and hop on a plane, a train, or the open road, and watch the scenery unfold. So many places are calling me: The Wallowas, Tomales Bay, Craters of the Moon, the Battenkill, and Copenhagen. When I travel I love to find a comfortable café to spend some quality time. The ritual sounds of the espresso machine (grind, tamp, drip, steam, and pour) feel like home and awaken the senses. A café promises plenty of overheard conversations, whether I understand the language or not. The new place begins to unfold here, with glimpses into the local culture: What people wear, what people read, the art on the walls, and the music they listen to. A short time spent in a new café fuels me for hours of exploring. I have logged many café hours in my life. Most were earned in San Francisco. So much so that the geography of San Francisco is tied to cafés I have known and loved. Some are still thriving, some long gone. I was lucky to live close to some amazing cafés like Atlas, Farley's, and Babar. When I first moved to San Francisco I worked in a corner café and loved the flow found from making latte after latte. These were old school lattes in tall glasses filled with steamed milk, a shot or two of espresso carefully layered above the milk, and a plop of dryish foam on top. I loved working there and being part of the neighborhood. San Francisco is now home to gorgeous coffee temples like Four Barrel, Sightglass, and Blue Bottle. I love them, but there is something about the homey neighborhood café that makes one want to linger and read another chapter. One of my neighborhood cafés was Que Tal. I first started going there because they carried my favorite City Bakery pumpkin scones, but I soon learned that they made excellent homemade soup. It was a comfortable, homey place with a resident chubby grey cat named Lucy. She would move from sunny spot to sunny spot, and from lap to lap. I am sad to report that Que Tal is now closed. When I moved out to the Richmond, I fell in love with Bazaar Café. This place is a hidden gem. They serve coffee, Japanese food, sandwiches, and sweets. The space is warm and decorated with wood and colorful accents, but the real secret is the backyard garden. Each table is surrounded by grasses, flowers, and vines. The Richmond is in the foggy part of the city, so on sunny days the garden was full of people soaking up every ray. After a stop at Bazaar Cafe, it is a quick walk to Clement Street, Land's End or Baker Beach. But the place that I miss the most is Radio Valencia. I loved the quirky-comfy ambiance and the amazing music. They created daily playlists that were curated both in house and out. They would provide a copy of the playlist at each table, like a menu. One day a fire truck smashed into the building. Radio Valencia reopened and then closed for good a few years later. Eventually the space became Beretta and it was again a happy place. Mr. Graham and I ventured there whenever we found ourselves in the Mission. They are known for their pizza, cocktail program, and especially their Rattlesnake cocktail. I am not sure how their cocktails fare these days, but for a time they were top notch. Recently Mr. Graham and I started to reminisce about San Francisco cocktails. We remembered that the Rattlesnake is similar to the Filibuster, from another of our favorite places, Flora in Oakland. It is interesting to research the diaspora of certain cocktails and ingredients. As it happens the Filibuster is a precursor to the Rattlesnake at Beretta. On paper this cocktail doesn't seem fancy, it is just an earthy version of a whiskey sour. But it is so smooth and perfectly balanced. I am going to refer to it as a Filibuster, because the Rattlesnake has its own provenance. If you look up the Rattlesnake in the Savoy Cocktail book, you will also find a whiskey sour, but it is made with a few dashes of absinthe instead of bitters. When I started researching this cocktail, I found a bit more about the history of this cocktail and the relationship to bars in the Bay Area on Savoy Stomp. Savoy Stomp is a great read. Mr. Ellestad is a dogged researcher, experimenter, and bartender. I can't wait to head down to the Coachman to enjoy a famous milk punch. This recipe uses grade B maple syrup instead of simple syrup. (FYI - grade B maple syrup is now known as Grade A, Dark/Robust - the Vermont Maple Board has updated their grading system). Whatever you call it, it is the richer, earthier syrup from later in the season. It has a higher mineral content. Maple syrup, of course, is from my homeland. My sister and her husband still gather sap and boil down syrup, like we did on our farm back in the day. This recipe calls for Peychaud's bitters, but I have also made it with aromatic bitters such as Angostura or Scrappy's. I can't say which bitters I prefer. All I can say is to be sure to include the bitters, they are essential! A variation of the Rattlesnake cocktail in The Savoy Cocktail book. Recipe based on one from Erik Adkins of The Slanted Door Family. He also designed the cocktail menu at Flora. 4 dashes of Angostura or Peychaud's bitters (or absinthe, to follow the Savoy recipe). Dry shake the egg whites in a cocktail shaker (no ice). Add the remaining ingredients and shake well. Add ice and shake again. Make sure the lid is secure. Strain well and pour into coupe glasses. There should be a nice creamy, foamy layer on top. Put a drop or two of bitters on top of the foam and make a design with a toothpick for decoration. Peychaud's Bitters and Old "Overcoat"
Mr. Graham and I have been re-watching True Detective this week in anticipation of the finale tonight. He suggested that I share something that would pair well with the show. The easy answer would be a tray of dark chocolate star cookies, a six-pack of Lone Star, and a bottle of Jameson. Or I could make ironic Long Island Iced Teas and dirty martinis, extra dirty. There is nothing wrong with the above choices, but I want something old, gothic, and a bit tangential. This show isn't perfect, but something about it has invaded my psyche. I love stories about stories. I am also drawn to character studies, and untangling the layers of stories we tell ourselves. But mostly I love a good detective story. I thought it would be nice to have some classic cocktails tonight, and two of my favorites fit the bill nicely. The Alaska is a good choice, as Rust Cohle is supposedly from there. Plus, it features Yellow Chartreuse, and it was invented in the South, in South Carolina to be precise. My favorite choice would be the Vieux Carré, because of its Louisiana provenance and rusty color. It is also one of my favorite drinks because it is seemingly complex, but surprisingly smooth. Of course, you don't need to watch True Detective to enjoy these two classic cocktails. This cocktail is humid and herbaceous, like the bayou. Stir it really well to make sure it is ice cold. Stir until well mixed and very cold. Strain into a chilled Nick and Nora (or small cocktail) glass. A variation of the Vieux Carré. 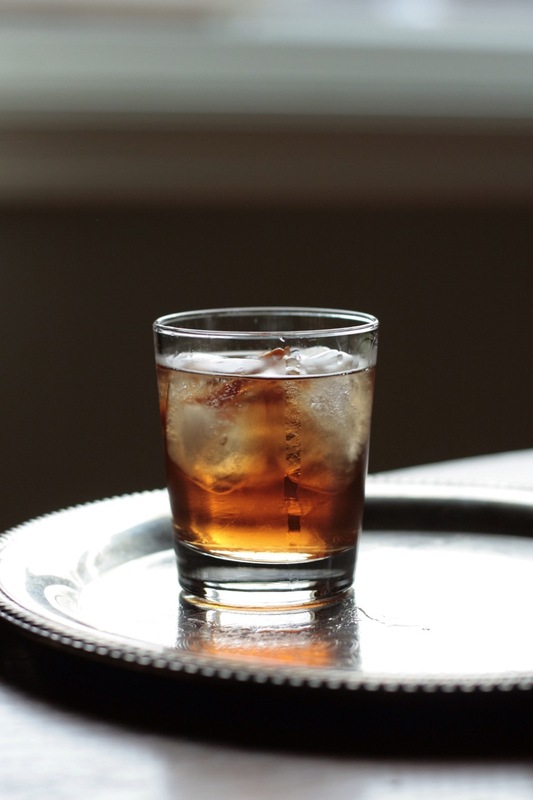 The Vieux Carré was created by Walter Bergeron at the Hotel Monteleone in New Orleans. Vieux Carré is French for Old Square, the area now known as the French Quarter. It features Peychaud's bitters from New Orleans. I would invest in a bottle for your bar, because it is an essential ingredient in both a Vieux Carré and a Sazerac, two of my favorite drinks. Stir all ingredients in a mason jar or mixing glass with plenty of ice. Strain into an ice filled old-fashioned glass or, if preferred, a chilled cocktail glass. Garnish with an orange twist. PS - A bonus drink for all you Cosmos fans. I recommend enjoying a Jupiter cocktail. A classic cocktail, and the only reason we have a bottle of Parfait d'Amour in the house. It is essential for this blueish purple cocktail. Shake in a cocktail shaker, and strain into a cocktail glass.